Oh, summer vacation, how I adore you so, especially when it includes visiting the Eastern European homeland full of beer. Yes folks, I'm back from Prague where a wonderful time was had by all, except for my liver. It's going to take a while for it to recuperate from all the pivo. The Czechs have been brewing and drinking beer for nine centuries now, as well as growing hops for more than a millennium. Some of the most famous styles and brews come from the region; it's no wonder that many beer lovers make a pilgrimage to Prague at least once in their lives. You do have to know that when looking at the beer list the number with each offering isn't the alcohol content, it's the degrees figure which is directly related to the amount of malt extract used during brewing. A high degrees figure generally means a fuller flavor and stronger brew. While there, you don't drink the major brands-Gambrinus, Pilsner Urquell, Budvar, Radegast, Staropramen, and Bernard-out of a regular old bottle. We usually visited microbreweries where, if they did serve a big brand, they served it unfiltered and/or unpasteurized. And with a half liter going for about $1.60-yes, $1.60-you could experiment with different degrees of beer. 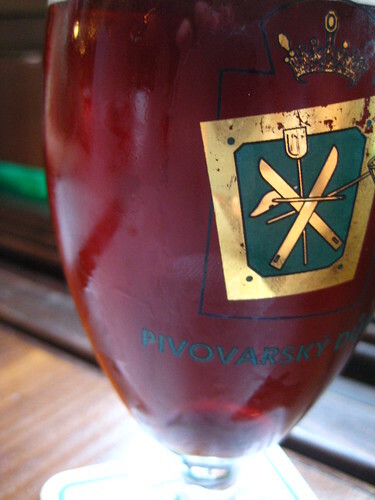 The first up was První Novoměststký, a restaurant and mini-brewery that opened in 1993. Here we had their 11° light unfiltered wheat beer, while eating the Brewer's Pan (roast knee, duck breast, bacon, sausage, roast potatoes, three kinds of dumplings, beans). Yeah, it was a lot of food. The cloudiness of the beer is due to the lack of filtration. There were two spots we dropped and stayed for a round. At Pivovarský Dům, I tried their sour cherry beer. It was good and tasted a little reminiscent of cough syrup. I did like that they include a cherry in the beer-it sinks to the bottom and waits like a tiny surprise. 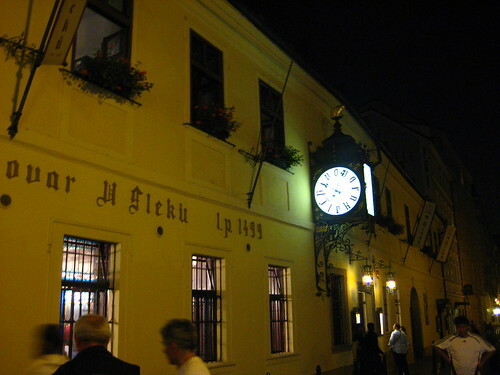 The other was U Flecků, a brewery that dates back to 1499, and is the oldest continuously operated brewery in Central Europe. We had planned to have dinner, but we unaware that the kitchen and back garden close around 10 o'clock. For New Yorkers used to eating late, this didn't work out so well. Their dark 13° beer was a nice trade-off from the lighter beers we had been having, even if it was heavy and reminded me of a stout. The garden area was gorgeous though, a good reprieve from the city streets. Just watch out for the waiter pushing shots. 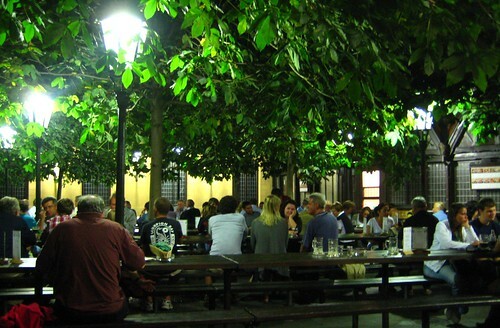 One of our favorites was U Medvídků, a beer house, restaurant, and hotel. You can't go wrong with a beer hotel. 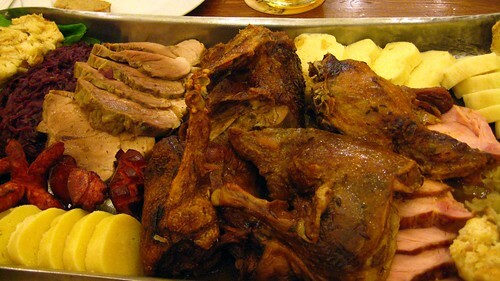 The restaurant part only dates back to 1466, wonder if the Bohemian Wedding platter-roast duck, 300g of roast pork meat, 300g of home-made boiled smoked meat, 100g of piquant bratwurst, 3 kinds dumplings, and 2 kinds of cabbages-was available back then. They're most famous for the strongest beer in the world though, the X-Beer 33 which is 12.6% alcohol and 33°, not a bad claim to fame for the world's smallest commercial brewery. 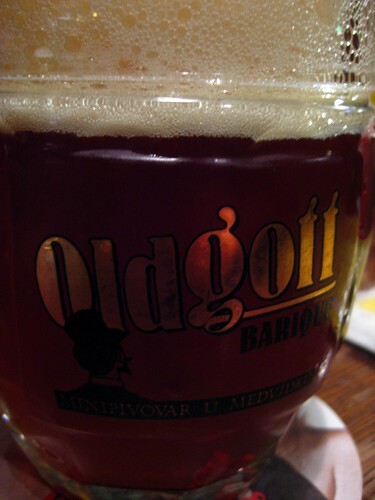 They also brew Oldgott, a darker, hoppy beer served straight from the barrel. 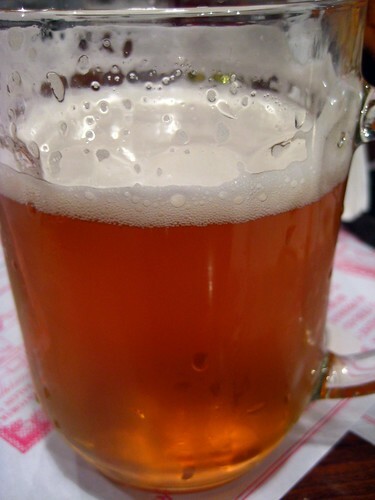 For more on Czech breweries, click here or here. Enjoy all the delicious beige food. And just try to find a vegetable.